Just on 2 weeks to go now till the opening night at Gaffa Gallery from 6 – 8pm on Thursday 25 June 2015 for this joint retrospective exhibition with fellow artist, Michael Hogan. This week I spent an afternoon at Gaffa in my capacity as one of their volunteers to help install one of the current exhibitions. All very good experience as Michael and I have to install our own work and ours is the next installation coming up! The exhibition will feature a diverse range of work we have both created over the last 15 years and all the artwork will be for sale during the 2 weeks the exhibition is running from 25 June to 6 July. Here is one of the images that will appear in this exhibition. Although getting organised for the other joint June/July exhibition mentioned above has been taking most of my time for the last few months, I have still been working on various ideas for this exhibition and will be able to seriously get into working on it in the next couple of weeks. The theme of this joint exhibition with fellow artist, Tracey Scheitel, is anything at all relating to water, whether it be water plants or creatures, how we use water, the sea and other waterways etc, so no shortage of areas to draw inspiration from. 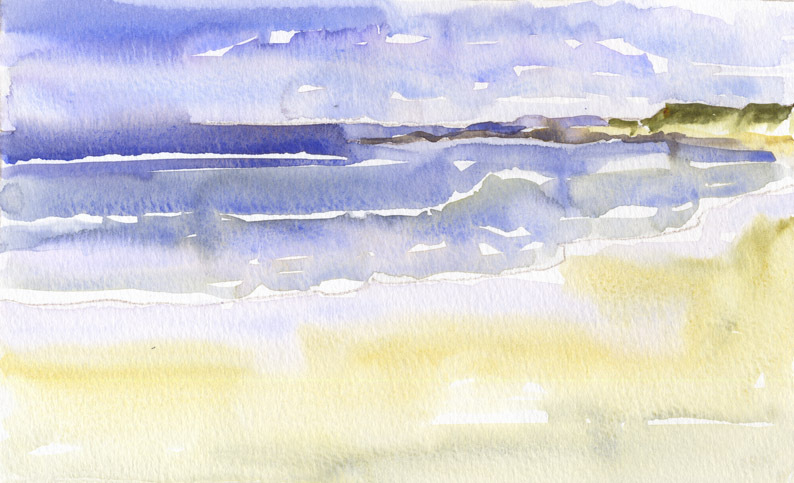 The image below is one that will be appearing in the exhibition and is a watercolour impression of Soldiers Beach which I sent this week along with a short description to the Central Coast free publication, iMag, to help with promotion of the exhibition. The exhibition will be opening on Tuesday 1 September 2015 at the Shorethyme Restaurant/Gallery at Norah Head on the NSW Central Coast. Hi Again I will be in Sydney on the 26th till the 29th at the Teachers Federation annual conference at the Town hall so I will go and have a look at the show then. Yay Ill get to see it after all I forgot about that.